Where predatory service providers and narrow margins once dominated the textile label printing market (think the wash care tags on clothing), Novexx Solutions and Century Systems bring you a new alternative that does the job for half the retail price with nearly 8 times the potential reseller margin. 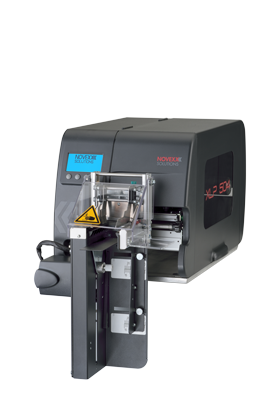 The XLP 504 TCS (Textile Cutter Stacker) utilizes the proven Novexx XLP 504 printer, and it is rugged enough to satisfy users well into the future. If your customers need to print on clothing tags, you can sell them the whole system for about half the going rate and capture new, high-margin, and repeatable revenue streams. Your customers want to automate their textile printing at a price that makes sense for their smaller scale operations. The comparable product retails at around $8000 while the TCS retails half the price at $3995. This strategic price point opens a new market space for our partners. Century Systems connects you with what you need to sell the TCS and its media. Our reseller focus makes us easy to work with, and we maintain our reputation as a trustworthy distributor and provider of hassle-free support and service.